Ever take a trip with the kids to a fabulous destination and all they talk about after is the hotel pool? With access to seven different pools, a stay at Corinthia St. George’s Bay in Malta won’t solve that dilemma. But it will ensure the whole family has plenty of memorable fun. As mentioned, the enormous and spectacular outdoor pools are the first thing guests notice upon arrival at this Corinthia property. The entire building is situated to face the beautiful seafront, including most of the pools, which gives it an infinity-style effect. One pool is adults-only, but the rest welcome children. There’s even a small, shallow kiddie pool for those families traveling with very young children. During off-season travel, families will enjoy the indoor pool, which is connected to the spa. For a change of scenery, there are two additional pools at the adjacent Marina Hotel Corinthia Beach Resort property. Want help booking a trip to Malta? The property also has an onsite dive school for those looking to experience some of Malta’s famed diving opportunities, as well as a variety of watersports and private yacht charters available for rent. But Corinthia St. George’s Bay caters to families in more ways than just ample swimming and watersports options. A children’s packet is currently being developed specifically for this property, centered around a cartoon turtle named Georgie. Many leisure activities, like guided tours and evening entertainment, can accommodate children also. Simply consult with the well-staffed concierge desk during your stay. The highlight of the rooms at Corinthia St. George’s Bay is the amazing sea view. The balconies are simply fabulous, both for catching sun and for staring into the horizon each day. As a few rooms at the property face inland, guests should make it a point to request one that’s sea-facing. Prices for a sea-view deluxe family room start at 140 € per night, which includes breakfast. Family rooms are somewhat small and dated, but do sleep four comfortably. 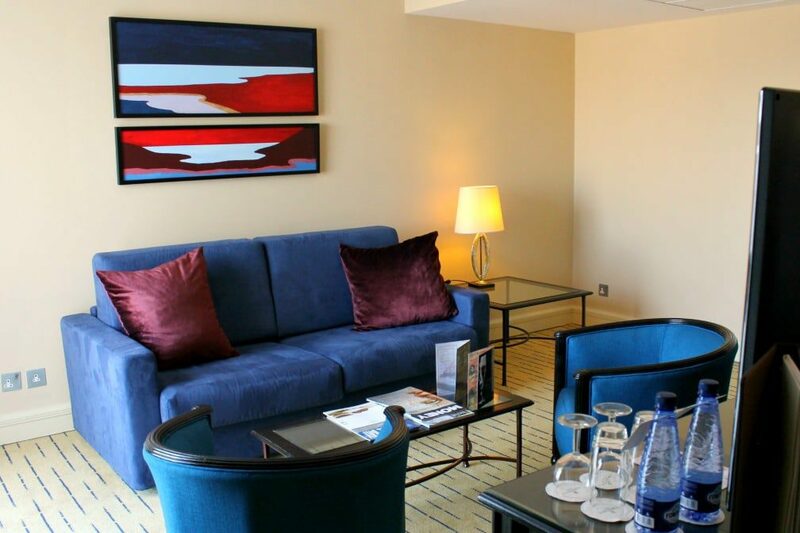 If you’re considering a stay of more than a couple of nights, I suggest upgrading to a suite, which will provide a separate bedroom space and a pullout sofa in the living area for the children. Just like there is a different pool for every day of the week here, it seems as though there’s a separate Corinthia-operated restaurant to choose from each day, ensuring taste buds never get bored. For the most kid-friendly option, guests should choose Henry J. Beans, a classic take on the American diner/sports bar. It’s a perfect place to catch a game or just grab a casual burger; the decor is fun and the atmosphere is lively. For a relaxing evening by the water, guests can get a light meal at the White Olive and enjoy its seafront (and poolside) location. For a quieter, more upscale option, consider reserving a table at the Caviar & Bull, which serves some of the most highly regarded and innovative dishes in Malta. A full breakfast buffet is also offered each morning in the sunny Fra Martino (also open for dinner). My sons would tell children staying at the property to be sure to order a hot chocolate. It was so thick and delicious and gave them plenty of energy! Teens will love that, during the high season, they can tweet their drink or food order right from the pool, and Corinthia’s Oasis Pool Bar staff will happily deliver it to them at their lounge chair. The hotel is located along St. George’s Bay, which offers a large and modern mall, many more restaurants (including Malta’s only Hard Rock Cafe), and a busy, active beach, all within an easy walk. For those intimidated by driving on Malta’s busy, curvy roads, there is a hop-on/hop-off bus company with a stop right outside the front door of the hotel. The route takes riders to all the major sightseeing options around the island. The concierge can also arrange various excursions when you do convince the kids to take a break from the swimming pools. Sometimes, when staying at a large resort like this, guests can feel isolated from the day-to-day life of the country they’re visiting. But my kids enjoyed a large park and playground only a few minutes’ walk away, which was full of local families on a Saturday morning. The boys played tag with a group of Maltese children while my husband and I chatted with their parents — and got some great recommendations on things our children would enjoy doing in the area. Given that the toughest decision a guest has to make is where to swim each day, it is clear that Corinthia St. George’s Bay is well-situated to provide families with a great deal of variety and a relaxing, enjoyable stay. Editor’s Note: Nicole’s family was hosted by Corinthia St. George’s Bay. As always, our thoughts and opinions on Ciao Bambino are our own. Photos by Nicole Wiltrout.